Social Media’s Return on Investment? I was fishing in the Tweet stream yesterday when I caught the following job posting for a social media coordinator. Several attributes of this job description struck me as odd if not misinformed. The job description sounds more like a wish list composed by someone in Human Resources rather than by someone who actually knew what they were requesting. 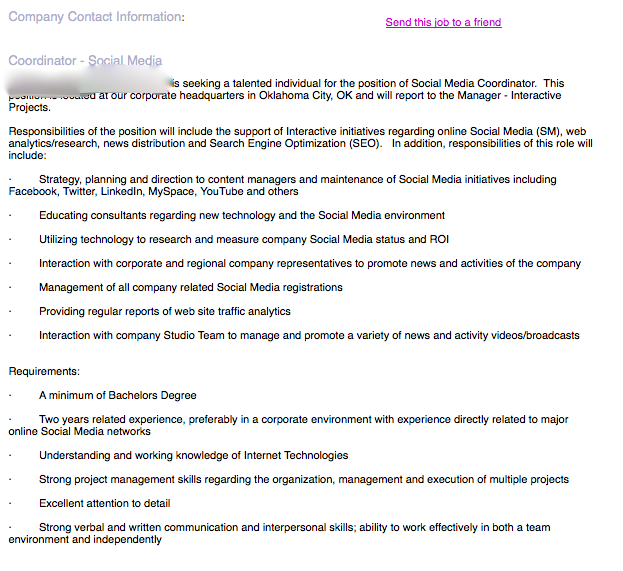 The idea that the future Social Media Coordinator position holder has to report to the “Manager – Interactive Projects” runs counter to the list of skills the job description requires. Any individual who has experience performing the following “social media” laundry list of tasks including the non-social media related disciplines of search engine optimization and web analytics while generating a return on investment would by definition already be a Manager – Interactive Projects – if not considerably more. Any search engine marketer or SEO worth their salt can answer the Return on Investment question, I doubt a majority of the new breed of social media marketers can. This entry was posted on June 17, 2009 at 6:18 pm and is filed under Search Engine Marketers, SEO, Social Media. You can follow any responses to this entry through the RSS 2.0 feed. You can leave a response, or trackback from your own site.